Pin It Now! 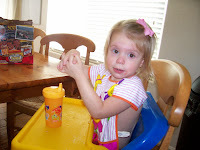 Out of the blue the other day, while still in her high chair, Shiloh folded her hands, bowed her head, and began mumbling something only her Creator could understand. It was so incredibly precious, and I tried to hurry quietly to get the camera before she ended her toddler prayer. But just as the camera caught the moment, she arose and shouted, "Amen!" I pray she accepts Jesus as her Savior at a tender age! I am so thankful that both of our boys have! I, too, pray that your sweet little one accepts the Lord at a very young age! And I thank God for the good guidance and spiritual direction you and Mark are giving and living to your children. I wish I saw more of it, because without it, once they reach a certain age (don't know exactly what that age is) chances of them learning or having any desire to learn to love God above all else are very slim. Instilling a love for God and things of God at a very early age is immeasurable to their lives. God is honored and you are blessed, when you make it the priority it should be. So, thank you for being faithful.